This starfish was on a rock out in the open, which made it easy to get a photo. I’m embarrassed to admit that after 11 years in Southern California, I haven’t been to some of the region’s must-see sights. But as I get ready to leave this gorgeous state, I’m trying to correct that. First, lets start with the places I have been to, as proof that I do sometimes get out. I’ve been to Walt Disney Concert Hall and the Hollywood Bowl; Dodgers and Angels games (much prefer Angel stadium); LACMA, MOCA (including the Geffen Contemporary for the Murakami exhibit a few years ago) and The Huntington Library and Gardens. I’ve gone hiking on the Palos Verdes Peninsula and run up Runyon Canyon; taken the ferry to Catalina Island (over-rated) and cooled off in the summer and skied in the winter in Big Bear (lovely). Yes that’s a long list but there’s a lot to do and see in this sprawling metropolis. As much as I have seen, I knew I hadn’t seen it all. So with plans to move to Las Vegas for a new job (technically, back to Las Vegas since I grew up there), I want to spend these last few weeks exploring classic California, from the beach to the hills to everything in between. To make sure I wasn’t missing anything, I Googled things to do in Los Angeles and got lots of Top 10 and Top 100 lists (like everyone else, I’m a sucker for a headline with a number!). But in reading these lists I realized I needed to stick to what was important to me. Pink’s Hot Dogs is on every list you’ll find. I’ve never been but I worked down the street from Pink’s for more than nine years so if I had really wanted a hot dog (or a turkey dog, since I don’t eat pork), I had ample opportunities to go. Plus, I hear there’s a Pink’s at Planet Hollywood in Vegas now. So if I get the urge, a Pink’s is close at hand. 1. Crystal Cove State Park. I heard about its tide pools shortly after moving to California, but had never been. So on a Wednesday morning after a body pump class at the gym, I drove 25 miles south along Pacific Coast Highway to the state park, which is between Corona Del Mar and Laguna Beach in Orange County. The park includes the beach and canyons where you can hike but I stuck to just the beach because I came to see the tide pools. I walked down the wooden steps next to Ruby’s Shake Shack and was immediately taken back to an earlier, simpler time. Cute colorful cottages dotted the bluff and families played along the wide, expansive beach. I found the rocky area where the tide pools were, but it was before low tide so I didn’t see much besides lots and lots of mussels. So, being in full relaxation mode, I threw down my towel, stripped down to my bathing suit and took a nap under the warm sun. When I got up an hour later, it was about 2:30 pm and the perfect time to explore the tide pools. They didn’t disappoint. 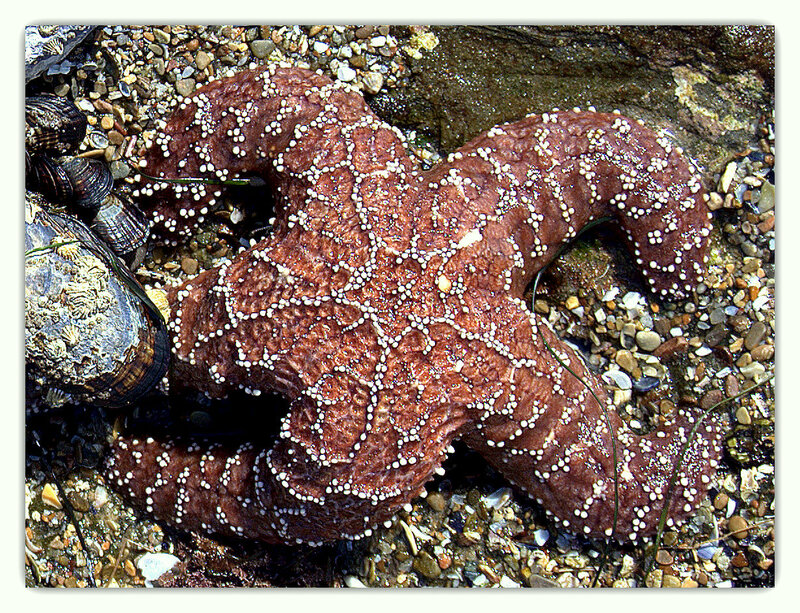 I saw hermit crabs, snails, sea anemones, tiny fish, a shore crab that scurried under a rock before I could get a proper picture, and then the pièce de résistance –two starfish. The first one I saw was smushed under a overhang so I couldn’t get a great picture. Then I heard a little girl screaming and it turns out she had found a starfish out in the open. I couldn’t understand why she was freaking out — it’s not like the starfish was about to get up and chase after her. I got a couple good shots before I had to walk away to escape her yelling “Can we go now?” and saying how gross it was (her dad tried to pick up the starfish so the family didn’t exactly impress me). It was a great afternoon and I’d definitely recommend going. Just make sure you bring friends so you can split the cost of the $15 parking, and check the tide tables before you leave so you’re there during low tide and can see the most sea life.